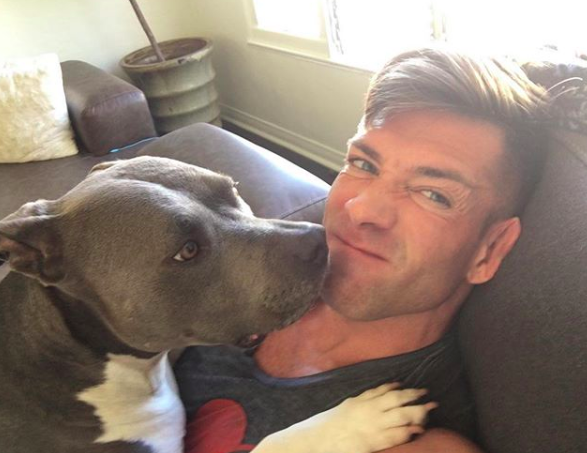 A gay adult film star is using his celebrity for good. Bruce Beckham, whose adult film credits include The Heat of the Moment, Barcelona Nights, and Fire Island Cruising 7, is teaming up with the animal non-profit Stand Up For Pits. Beckham says he will donate “a significant percentage” of his paycheck from every scene he films now through April 2 to the organization. Beckham says he’s already filmed two scenes this week, and he estimates he’ll be filming at least two or three per month for the next two months. He did not specify what percentage of his scene rates he’ll actually be donating, however. Speaking to Gay Star News, Beckham says he first fell in love with pit bulls back in 2004. Stand Up For Pits helps find safe homes for pit bulls, as well as funds emergency surgeries for abused animals and works to end discriminations against the breed based on misinformation. FINALLY got to meet these magical hippos today. Todd is a Boss and Sally is the most venerable manatee you’ll ever meet. Many thanks to @rebeccacorry for making time for me to finally meet her kids., and for all her ceaseless efforts with @standupforpitsfoundation to save more beautiful Pibbles like these.???? He does kind of look like a younger David Beckham. Very worthy cause but I would never get anywhere near a pit bull. Whenever you hear about dogs attacking their owners it’s usually always that breed. Respect to anyone giving them a loving home though. Pit bulls, like any large dog such as a German Shepard, Boxer, Rottweiler, Doberman or the like, are wonderful animals. The biggest problem with animal attacks from large dogs is not the result of the dog but the owners. Any dog can be aggressive and dangerous depending on how it is trained or abused. The problem for pit bulls is that they are large dogs, with extremely strong jaws, and are capable of inflicting massive damage. Not unlike a Mastiff, Rottweiler, or other large dog. They make wonderful pets for a responsible owner. Maybe, who knows. What I do know is I’ll never take a chance with s pit bull. Many pit owners have them because they know they intimidate people and they get off on that power. When’s the last time a poodle mangled anyone? Sure, any individual dog in a loving home probably be a great dog. And, all dogs are potential biters. But breeds have been bred for specific physical and disposition attributes. That sweet pitbull who just happens to have very large jaw muscles that can exert a tremendous bite force did not just appear naturally, it was selectively bred. I work in a field that unfortunately deals with aftermath dog attacks. The usual culprits for bites are: pitbulls, rotts, german shepards and boxers. I would in no way buy a pitbull if had to be around a baby, small child or someone vulnerable in some manner. That’s odd. I was preparing to be excited until I read the article. 7 years ago, we had to put both of our Black Labs down within 6 weeks of one another because of severe hip dysplasia. After we stopped crying, we went to the Animal Rescue and found Carolina. She was a one year old Black Lab/Pitbull mix that had not been spayed. When we walked around the corner, she picked her head up just a little and gave us this, “Well what the hell took you so long to get here and take me home! ?” look. Within an hour she was home and had already established the loveseat as HER bed. When we went to bed that night, we had just said goodnight and kissed and I was reaching for the lamp when BOOM here Carolina came at a dead run – all 60 pounds of her – right between us, leaning against my husband and sliding her head under my hand. She’s been there every night since. Unless some dog-abusing psycho has taught them otherwise, they love people probably more than any other breed. Pit bulls are one breed that needs to be removed from society. They’re a viscious breed. Every summer there are multiple instances here where I live of random people being attacked by them, and of the animals being put down by police. Better off just removing the breed all together. Kudos to him for this. I’ve rescued animals and I know I get so much back spoiling them. I’ve never been fortunate enough to be a human to a pit, but growing up my neighborhood had lots of kids and my neighbor had one who loved us all. His dog always jumped over the wall into my yard to play with us when he heard us back there and would jump back over when we told him to go home. He also adored my mother and would keep her company while she gardened. It really is the fault of the humans that train them to be hostile. They really are gentle dogs. I play with them at the dog park, after I get permission of course. ?